Description: Mahatman Gandhi stayed here in 1931 when he was to attend a Round Table Conference. He had refused to stay at a hotel, but would come if he could live with the working class, so he stayed here. He visited the Nursery School and apparently all the children called him Uncle Gandhi. At six o'clock each morning, after his prayers, he took his walk along the canal, talking to workmen on the way.... There was something about him that always lives with the people. 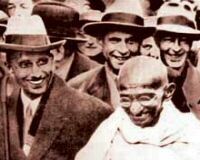 Among his visitors Charlie Chaplin, the Pearly Queen and King of East London, and many politicians sought out Gandhi during his stay at Kingsley Hall. He stayed here for 12 weeks, accompanied by a goat which provided him with milk. The Hall was also the workplace of RD Laing, one of the most important figures in mental health treatment.